In the first 4 columns I am putting October results. States ranked according to their electoral participation. Rounded up numbers of Capriles and Chavez votes when there were 98% votes counted. Any future difference in the CNE result page will thus not matter much for this text. The opposition only won in two states, among the states with the highest participation. Oppo blue or light blue when "leaning" and chavismo red or pinkish when leaning. I have assumed that abstention will be higher than on October 7 since it is not a presidential one. That is, I have taken votes away from oppo and chavismo in the following way: 3% of the registered voters for the opposition and 5% for chavismo. In other words I am assuming that 8% more people will abstain in December, split as such. This is close to the average abstention in Venezuela, between 30 and 25%. Also, the spread in October between the states was a mere 10% so I guess we can use that 3/5 rule for all though obviously chavismo would be affected the most in abstention where they got the highest vote. But again, after my fiasco prediction for last October I am doing strictly an overly simplistic arithmetic model. With this consideration we observe that the opposition gains three states and has two leaning its way. But I am not ruling on all states in these columns because on the last two columns I have introduced a governor factor. That is, in some states I think that the choice of governor candidate might damage further the chances of one side or the other, mostly the Chavez side as some candidates have a limited knowledge of the states they have been sent to by Chavez. I will explain later the why I think such and such is a problem candidate. For the time being, very conservatively I have assumed that the effect of a bad candidate is a mere 2 or 3% further penalty through increased abstention. I am not considering here dissident candidates which can have a much bigger effect, that will be looked upon, maybe, at a later date, if I care enough. Even with that penalty for bad candidates, I still add only one "leaning" for the opposition, the other states still in the chavismo column, leaning or certain. This explains why Chavez has not cared about offending intra-party and ally sensibilities: based on October result he went all for all in his choices because if the opposition needs to gain 10 to resist with some effectiveness, Chavez needs 18-20 to launch his constitutional reform without trouble. All in all, in this table I give at best 8 states to the opposition, with the notable loss of Carabobo. One of the "iffy" states is Zulia which loss would be a major disaster for the opposition even if it got the other 7 states. Not to mention that Tachira and Anzoategui may have to be put on the "iffy" list because in one the opposition may go divided and in the other former chavista Paraqueima has suddenly decided to do an Ojeda: on the wrong side of the Anzoategui primary he decided to go back to Chavez. One of the reasons Venezuela is in such dire straights is because we have particularly unprincipled politicians like the Paraqueima, exchanging gunfire one year and kisses the next. Anyway, since I wrote above that I was going to give the very most optimistic scenario I could come up with I have added a "gut feeling" column. I am not giving anything more to the opposition but I am passing 4 chavista state from certain to leaning. And it is on that basis that I discuss a few states initial odds next. Sucre. The red candidate, Acuña, is a colorless bureaucrat in a state that has been badly misruled by the sitting red governor that Chavez is not allowing to run again. Even if Chavez won well, surprising many, it does not make Sucre a rock solid Chavez state. Bolivar. That state was supposed to be a shoo-in for Capriles and yet went Chavez. Apparently the electoral buying was heavy there. But the governor has a dismal record and the only reason why Chavez allowed him to run again is because he is a general. 4 years ago he won because the opposition was divided. Zulia. The surprise Chavez victory there has rattled the opposition a lot. Fortunately even with a huge amount of money spent by Arias Cardenas, another one that crawled back to Chavez, Perez should be able to retain the state. But he is in for the run of his life. Falcon. I thought that Falcon was a weak spot but it seems that blowing people up at Amuay did not affect Chavez at all. People noticed that he was giving away new housing to victims real fast, while nobody defended those that were about to move in and were pushed down the list. Another clear case of sinverguenzura as personal security count for nothing when a free gift dangles in front. With such a crowd we can infer that the latest jail disaster in Coro will increase further the sitting red governor share. 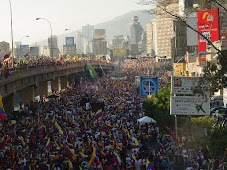 Carabobo. In spite of all of his efforts Salas Feo could not bring his state to Capriles, putting himself in very serious risk. Fortunately for him Chavez put one of his worst candidates there against local favorites. Salas Feo on paper should lose but he may have a chance due to chavismo mistakes more than his own work. That his work has been sabotaged at each step by chavismo is of course something that ungrateful voters care little about in Venezuela. Monagas. The ex red governor "el gato" Briceño did not manage to bring that state for Capriles. Monagas, having earned the palm for the most electorally wretched state, could have a chance to redeem itself if the opposition and "el gato" put their act together considering that the chavista candidate is no gift. Miranda. The point in Miranda is not that Capriles should win it, is that he needs to win it with 55% of the vote. Fortunately the help of charisma free, repulsion full, Chavez candidate Jaua, should help a lot even if Jaua has probably the biggest check book of the campaign. Nueva Esparta. That state should be anti Chavez, but he needs it for drug trafficking and sent a general for that. And Morel is an old school pol who has overstayed his welcome. Anzoategui. That state should go to the opposition even though Chavez won it because he sent a lousy candidate there. Then again wallets speak loud and the Paraqueimas are suddenly back into the chavista fold. Tachira. I have put this state in blue as all logic indicates but former mayor of San Cristobal never accepted that there was no primary and pulled a surprise running as independent. A divided opposition is sure to lose there so we must hope a last minute arrangement. Yaracuy. One of the least awful chavista governor is almost certain to repeat as the oppo candidate is at best a zero sum game for whom this blogger will have a hard time to vote for. Aragua. That state should go chavista but it could end in a major upset. Chavez has dispatched there one his most inefficient minsters who in addition Aragua knows they are second choice for him. On the other hand the opposition runs one of its best candidates with Richard Nardo, an ex street vendors who can relate with el pueblo. Lara. The problem here is that after Miranda this is the state that Chavez wants the most and sent back, with the biggest of wallets, its former governor Reyes Reyes. But current ex red governor Falcon has a genuine popularity and many in Lara are aware of the unfair deal meted to him by chavismo. A possible victory with more than 55% for Falcon would be a major, major slap to the military wing of chavismo as Reyes Reyes is part of the military coterie that truly runs Venezuela. Not to mention that Reyes Reyes was a pitiful governor. This being said, this optimistic scenario look way too optimistic at this point. The Chavez reelection has rattled a lot of small time politicos and the idea of staying 6 more years out of the loop of easy money is more than what they can deal with. According to the wretched vote sellers of October 7 we should not be surprised that all those wretches who did not well in the opposition primaries try to get some crumbles from chavismo. We re indeed a sorry country. But if this were not bad enough, the opposition leadership is taking way to much time in coming clear with some issues lingering from October 7. As such I am wondering today if we are going to make it to even 4 states. Personally I have no intention to cover a debacle caused by the disgraceful chavista voter and the barely less disgraceful opposition voter where abstention is suddenly getting fashionable again rather than fighting back, amen of other quirks such as wanting to turn Capriles into a new dear leader of sorts. Maybe, just maybe, we should let chavismo run its full course as the only way this country will learn the ways of the world. "Not to mention that Reyes Reyes was a pitiful governor". An understatement? The only state where chavismo has ever performed better in local elections than presidential elections is Merida. In every other state Chavismo generally loses 2-10 pts. What are you telling us? A landslide for the opposition just two months after a major chavez feat? What you are saying is true, but there is a factor you do not consider. All the elections you mention are spaced among themselves by a year in which often some significant political event occurred. This time around there will be no major event until December and the electoral machinery and. Blackmailing tools will still be largely in place. In other words I am afraid that trends will not help us much this time around.